Nice review , thanks very much. Now they have a UK retailer I may give a few a try, the baby poop one looks like it could have some uses , I tend to use vallejo for my sepia stuff as I just buy it with the paints, but there are some interesting colours there. Yes, we have the full range in-stock in the uk at http://www.basecrafts.com and will restock as required. We also have a promotion running where if you buy 10 of the washes we’ll throw in a free basecrafts weathering powder. I’ve been using the washes myself and i like them, you do need to remember to shake the bottles very well before use, they flow very well and dont require mixing with water, you can however add some water if you want a lighter effect. The colour range they offer is extensive. Indeed, I really like them ! I find the choice of colors great. Yes, some are unique to the SW range. Hope to get my hands on some in the future. Sorry, I mean Romain, can’t spell today. It’s all right… Next time I’ll wear pink. Its not that bad, you could be using yourself to demonsrate the washes! I liked the Gallic look Romain, just lacking the beret and string of onions. Do you think you could get an extreme close up? I can’t really see the results too well. I would love to know how these compare to the vallejo and citadel both of which I use ALOT. Manicray — these are an entirely different product. The GW and Vallejo washes are effectively inks as they’re solvent based. The Secret Weapon Washes are a true acrylic suspension — making them, in effect, very, very, VERY! thin paint with a liquid pigment base. This has the advantage of providing a little body coverage, to blend your shadows, or a lot — depending on how you apply the product. You get consistent colour and coverage every time and there’s really nothing else like them on the market. 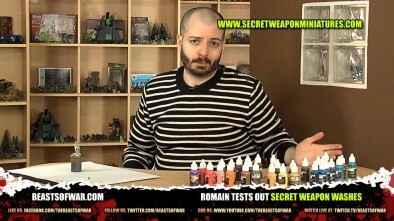 Romain, How would you compare the Secret Weapon washes to Citadel washes? Thanks! And great review! There’s not much comparison, really. Citadel washes are glossy (which makes your minis toylike if used all over the place), and pool thickly on the details. They take a while to dry and can seem a bit oily, as they’re solvent based. Secret Weapon washes are matte, they don’t hide details as they are consistently thin and fine. They are also more varied. My choice is made ! Ah, the price is a point I hadn’t thought to bring up. But with the Secret Weapon Washes you get 20ml for $2,99 in the colonies — compared to the other washes that means you get almost 70% more product with a lower price point. Thanks Romain and misterjustin for the replies! That’s a fair point — because the Secret Weapon Washes aren’t one trick ponies in the way that ink washes are. If you want ONLY recess shadowing I recommend thinning the washes a bit — then apply them like you would any ink. 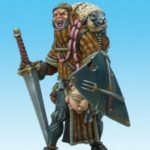 If you want a little bit of body shading use them as-is and feather them into the recesses, like you would blending paint into shadow. If you want a LOT of body shading put down your base coat and use it like you would a thin paint — and understand that if you glob it on you’ll get an effect similar, but far more controlled, than “dipping” a model. That much acrylic will also give you a bit of shine — even though it’s a matte product if you apply a really, really thick coat like this it’ll have some reflective properties. Les is much more experienced at this… But after only my second try I’ve had excellent results ! My only advice to @karrde is to experiment… See how the product “behaves” for yourself, you’ll be happily surprised ! Thanks Romain! Good works as usual. @bigneily … when we got the washes sent over from the US, the UK Customs got hold of them and wouldn’t release them until we paid them a fee… it’s a damned liberty! 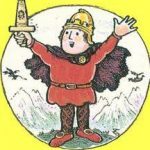 Having a UK supplier makes much more sense, no fuss with “the man” and easy postage. I think it also makes it easier to send to the EU… but don’t quote me on that. Huh. Coulda sworn I posted a comment on this. 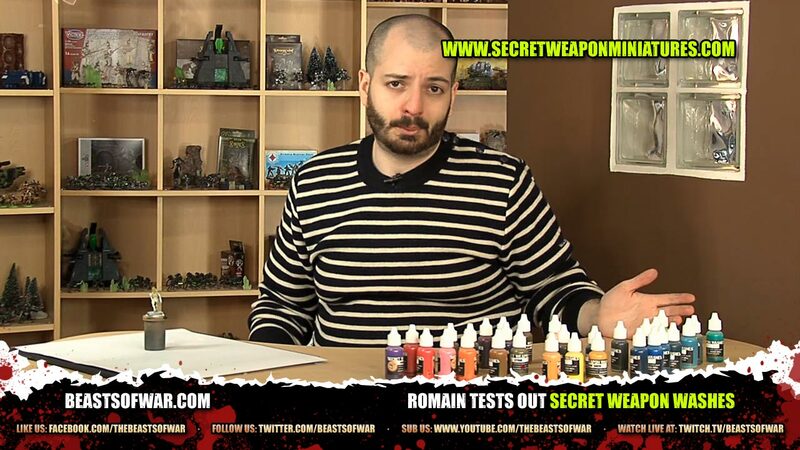 But anyway, I’ve used Secret Weapon washes myself and while I don’t think they shade quite as gradually as the GW washes, they do have a lot of colors, which is why I keep going with them over GW. I can’t think of anyone else who would have a lime green wash or a pink wash! Also, the concrete wash is pretty much essential for anyone who want to make concrete terrain. Gradual shading… well that depends on how you apply them. If you’re putting it on heavy and thick you’ll get fast, heavy body coverage. But if you feather the wash into the recess, like you would when you’re painting normally, you’ll get a nice, smooth transition. I have to say that Golden Brown is one of my favorites — since it’s the ONLY metallic wash on the market and makes such a nice gold shade. Concrete and Stone are indeed MUST HAVE products for urban environments. And now I think I need to work on some new SWM Washes videos, don’t I?